One of the highlights of Afri’s year is the Annual Doolough Famine Walk and 2015 was no exception. The walk encapsulates many elements, from the tragic story which it commemorates to the reality of continuing famine and food inequality today; the local and the global, connecting Ireland, Africa, Asia, Latin America and the world. The breath taking beauty of the landscape and the way in which Delphi Lodge has now embraced the story adds another dimension. East Timor was the focus of the 1993 walk, which was led by Tom Hyland and Timorese students Dino Rai and Jose Lopez. The walk is also a generator of ideas and images, a place to plant trees and potatoes, to sow seeds to sing songs and recall stories. In May 1994, Don Mullan and I left from the walk to attend the inauguration of Nelson Mandela in South Africa. On that occasion Arun Gandhi, grandson of Mahatma Gandhi, and his wife Sunandra had just led the Famine Walk and unveiled a memorial to Mahatma and Michael Davitt in the famine graveyard in Swinford. Gandhi, of course had strong links with South Africa, spending many of his formative years there before returning to India to lead the independence movement. In 2015, I left the Famine Walk to fly to Dili, capital of the first newly independent state of the 21st century, Timor Leste. I last visited Timor in 1999, as part of a human rights delegation including Fr. Michael Lapsley and Robbie McVeigh from Derry. We met with many groups and individuals on that occasion including the leader of the resistance Xanana Gusmao, who was in prison in Jakarta at that time. Soon after he was released and a referendum was held in which the people overwhelmingly voted for independence. A period of extreme violence followed when Indonesia unleashed armed militia against the people. More than a thousand people were killed at this critical period of Timor’s liberation story and tens of thousands were forced from their homes to seek refuge in the mountains. A decision to deploy UN peacekeeping troops was crucial and one in which the East Timor Ireland Solidarity Campaign (ETISC) played an important role by lobbying key decision makers in and around the UN. This allowed Timor to make the transition from occupation to independence which was officially ‘restored’ in May 2002, having been first declared before the invasion in 1975. This was one of many important interventions by ETISC since it was founded by Tom Hyland and launched at Afri’s Good Friday event in 1992. Another such intervention was when Australian Prime Minister, Paul Keating made a nostalgic visit to Ireland, the land of his ancestors in September 1993. It is believed Keating’s family left Ireland around 1855, ‘probably as a result of evictions’. ETISC organised a well attended candle light vigil outside Dublin Castle, while the Prime Minister was being wined and dined inside, highlighting parallels between Keating’s ancestors and the eviction of people in East Timor under Indonesian occupation. The vigil also called attention to the Australian government’s extensive military and economic support for the occupation, despite five Australian journalists having been among the first to be murdered as Indonesian troops invaded in 1975. 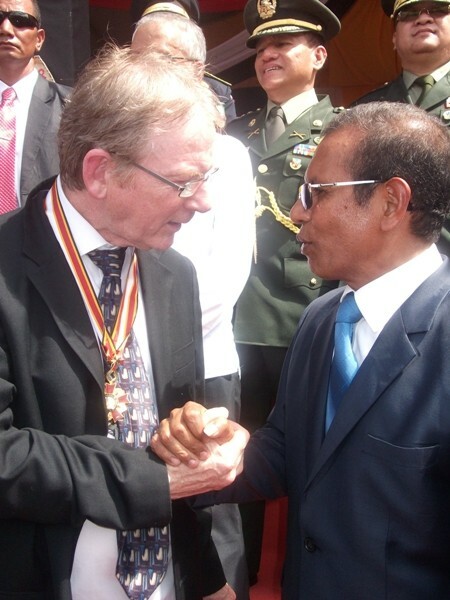 Timor Leste Presidential Medals were presented to the East Timor Ireland Solidarity Campaign and Sean Steele in Maliana on May 20th in recognition of their outstanding support for Timorese independence. 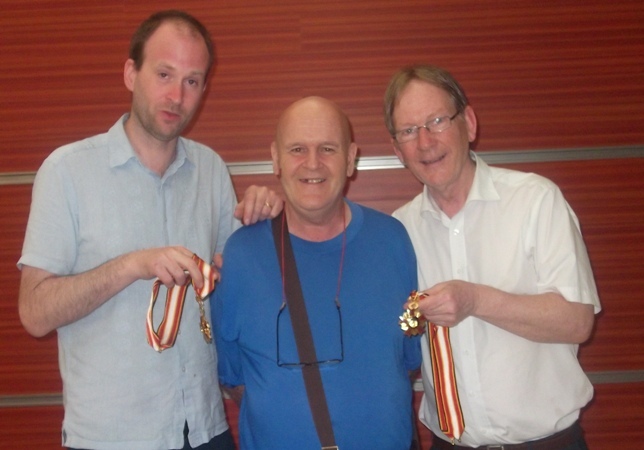 The medals were accepted by Joe Murray (right) and Oran Doyle (left) on behalf of the campaign and Sean Steele respectively. Joe and Oran are pictured here with the campaign’s founder and driving force, Tom Hyland (centre). I flew to independent Timor Leste on May 17th to accept an award from the President in recognition of such imaginative and consistent solidarity offered by ETISC during the occupation. I was accompanied by fellow ETISC member Oran Doyle who accepted an award on behalf of campaigner Sean Steele who unfortunately was too ill to travel. The heroes of East Timor’s independence struggle were of course its courageous people, nearly 200,000 of whom were murdered and many of whom endured unspeakable hardship and oppression. We met ‘veterans’ of the struggle, some of whom had spent twenty five years in the mountains, tirelessly resisting the brutality and the occupation. But the Presidential awards served to illustrate the importance of international solidarity, especially on behalf of small nations crushed under the jackboot of powerful neighbours. West Papua and Western Sahara are in a similar situation today and we must show solidarity whenever and wherever possible to these long suffering and courageous people. Also , Australia refuses to negotiate regarding the resources of the Timor gap, which were ‘given’ to Indonesia as part of a flawed agreement with Australia during the occupation in 1989 – another cause for international solidarity which Afri will be taking action on in the coming months. To paraphrase a well known quote “Solidarity…can turn the direction of history”.